As part of my Monday Munchies series, I will feature a different eatery for a review on the first and third Monday of every month. Hope you enjoy! Crunchy fries. 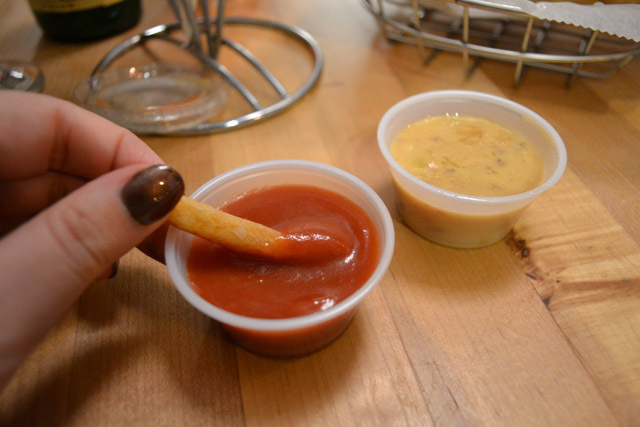 Inventive dipping sauces. Great beers. Sweet waffles. 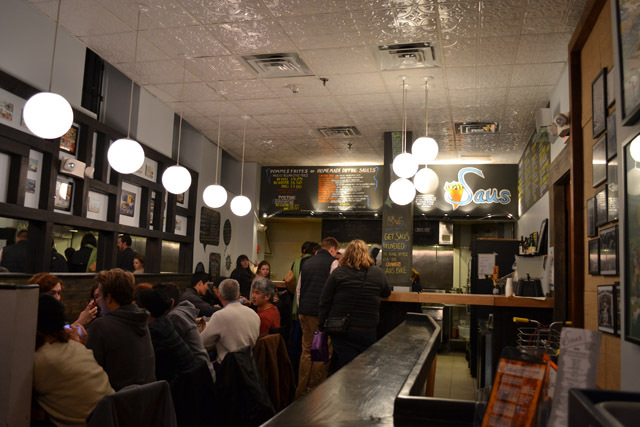 Saus specializes in Belgian inspired street food. 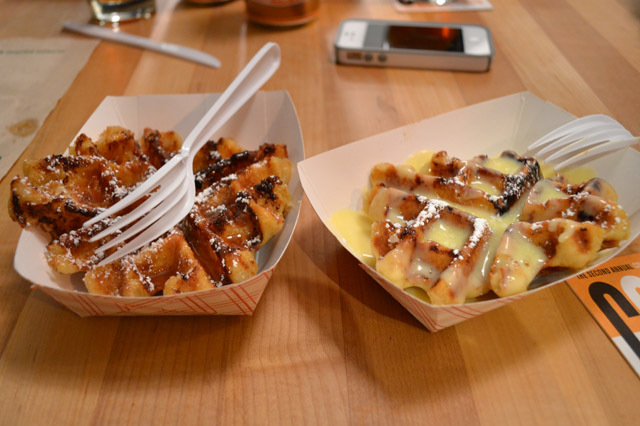 They serve up frites and waffles that are common place in Belgium, especially in street carts. 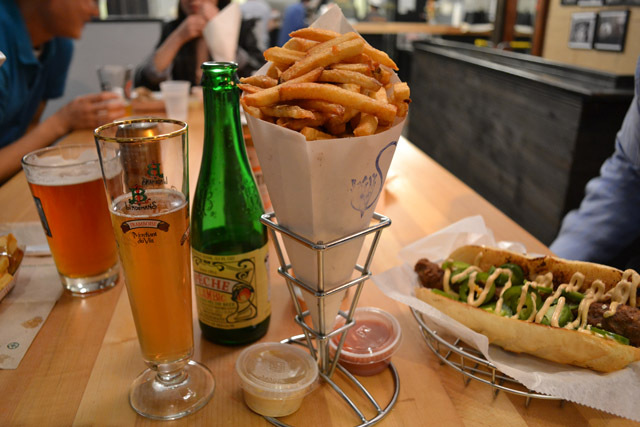 While poutine is really a Quebec based dish the team at Saus incorporated it into their menu at their frites make for the perfect base to build this dish on. Their french fries hold up to their thick gravy and staying crisp as you munch on fries and the cheese curd that tops it all off. When they first opened their poutine was my least favorite menu item as their gravy was too thin. They have worked hard on perfecting their recipes, including their gravy, and now I really enjoy it. 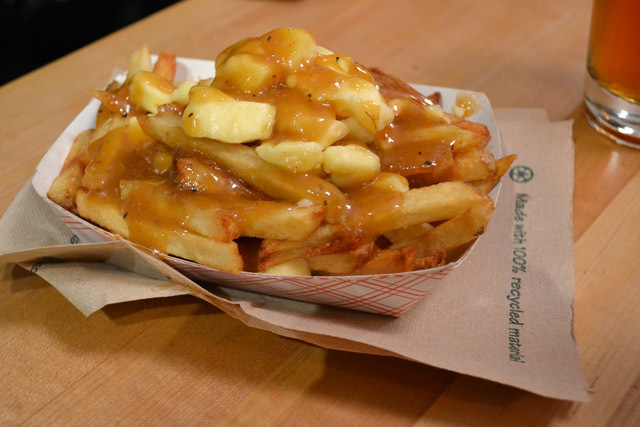 It now reminds me of the poutine that I had in Montreal. 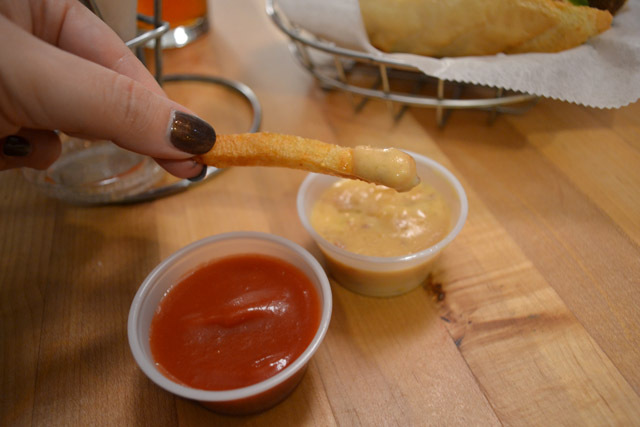 If you like your fries plain then order from the pomme frites menu. They offer 3 portion sizes (small, regular, and big) ranging from $4.25 to $7.00. The fries are cut in-house and are twice fried and prior to them filling up your fry basket they are tossed with a flaked salt. 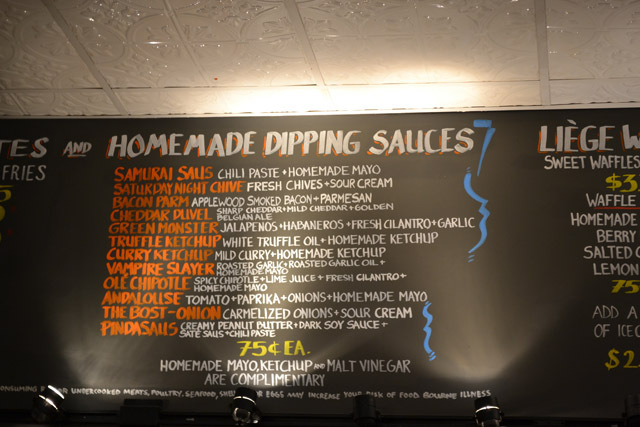 Saus specializes in their homemade dipping sauces. You can enjoy basic ketchup and mayo or you can get some of their creatively named and flavored sauces. Doesn’t ‘Saturday Night Chive’ with it’s fresh chives and sour cream sound great? Or how about ‘Vampire Slayer’ with roasted garlic, roasted garlic oil, and homemade mayo? 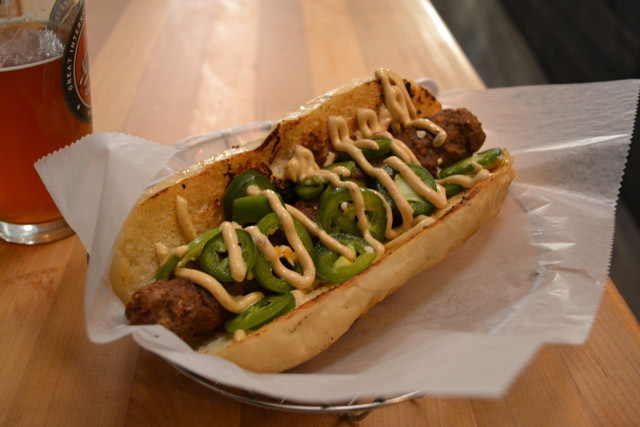 If you like spicy you should try the ‘Green Monster’ with its jalapenos and habaneros peppers and fresh cilantro with garlic. My go menu item is their Frikandel sandwich. A frikandel was created in the 50’s and is a handmade sausage that is similar to a hot dog, but since it does not have a casing on it is similar to a burger in that regard. The real kicker is that it is deep-fried so I treat myself to this occasionally. My favorite way to enjoy the sandwich is ‘Spicy’. The other kinds- Special, Burger Style, and Double Cheddar- are all great by my favorite is Spicy as the Frikandel is topped with house-pickled jalapenos and a spicy sauce. They make Liege style Waffles, which are sweet, dense waffles that have pieces of pearl sugar in the batter that caramelizes on the edges in the cooking process. They serve the waffles with different sauces. I think that the can’t pass up sauces are Salted Caramel and Lemon Cream, which is their homemade lemon curd and cream sauce. Total yum. 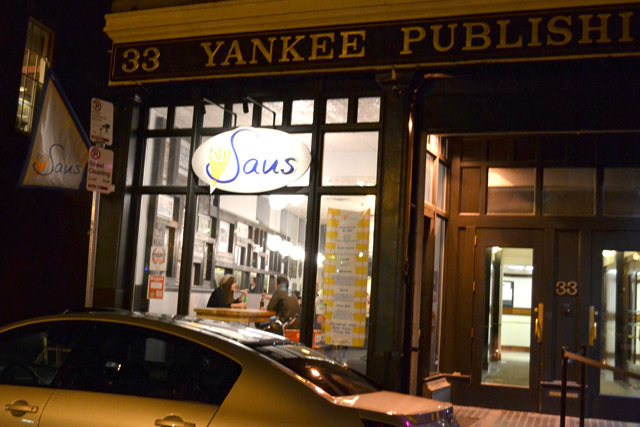 Located near Faneuil Hall and Government Center, this is the perfect place to stop in and grab lunch. 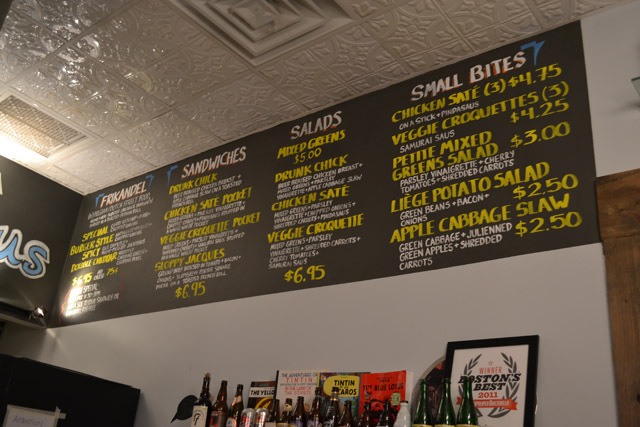 Or if you are out enjoying the local bars stop by for some late night eats.